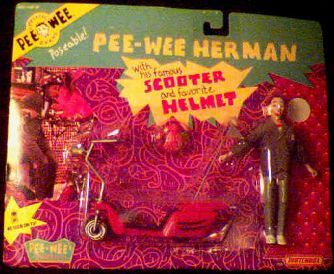 Six inch tall Pee-Wee Herman figure with his famous sccoter and favorite helmet. Great graphics. Still mint on mint card. This is a very cool toy. Pee-Wee's Playhouse is still one of my favorite tv shows. It was the most creative Saturday morning kid's programs of the 1980's. Website design and hosting by Sohodojo Business Services. Item 283 of 466 items displayed in viewer. 0 items in cart.